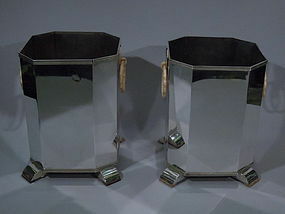 Pair of fabulous Art Deco-style silver wine coolers. Each: Rectangular with straight sides, reeded rims, and faceted corners. Rests on 4 arched feet, which in turn, rest on wood support. Ring handles and triangular mounts. Fully hallmarked. Excellent condition.